Vote Now: Where Should NASA's New Mars Rover Land? Where Should the Next Mars Rover Land? 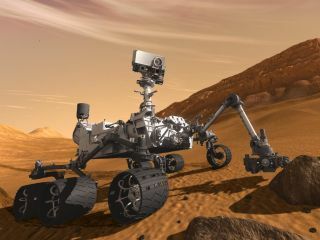 NASA's next Mars rover, a car-size robot known as Curiosity, is slated to launch in November 2011 and land on the Red Planet in August 2012. Its main mission is to assess whether Mars is, or ever was, capable of supporting microbial life. Exactly where the rover touches down is crucial. The landing site must be near an area abounding with signs of past water activity, because life as we know it relies on liquid water. It should also be close to some interesting geology, which generally means hills, valleys and exposed rock outcrops. And it has to be safe for the rover to land. NASA has narrowed Curiosity's possible landing sites to four candidates: Eberswalde Crater, Gale Crater, Holden Crater and a region known as Mawrth Vallis. The space agency is expected to make a final decision in late June or early July. Which one do you think NASA should pick? Gale Crater is near the Martian equator. It offers access to a wide range of rock strata, including sulfates and phyllosilicates (clay-like minerals that preserve a record of long-term contact with water) in a mountain three miles (5 kilometers) high. Curiosity could probably drive partway up this mountain, checking out layers deposited during wet periods with changing environmental conditions. At this site in Mars' southern hemisphere, an ancient river once flowed into a lake, and the area abounds with phyllosilicates. Here on Earth, oil geologists have built up a store of knowledge about how to look for organic materials in river deltas. Mission scientists and Curiosity may be able to tap into that knowledge in operations at Eberswalde. This crater, which is close to Eberswalde, is about 100 miles (150 km) wide. It contains many gullies, alluvial fans and other features carved out by running water, and may also present the chance to look at mineral layers deposited in a lake. Exploring Holden fully would likely require Curiosity to drive down into a broad valley. This apparent flood channel in the Martian southern hemisphere is one of the oldest valleys known on the Red Planet. Its layered terrain contains several different types of clays, giving Curiosity the chance to study changes in wet conditions over the eons. This is the only one of the four landing sites that possesses interesting geology for the rover to check out. At the other three, the study areas are outside the landing zone, requiring the rover to make more of a drive before starting its science work.